Winemaker Isabelle Dutartre's own label. A native of France, Dutartre notes that 1789 was a time of revolution in France and 1789 wines reflect her own personal revolution when she moved her three children from the south of France to Oregon wine country. She has made wine for over 28 years, beginning in Oregon in 1993 when she commuted back and forth between Oregon and France. She currently is the winemaker for De Ponte Cellars in the Dundee Hills where she as been the winemaker since their first vintage in 2001. 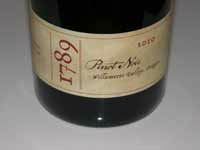 The first 1789 release from the Chehalem Mountains appellation was from the 2007 vintage. The wines are sold through the winery's online store (Northwest Wines To You).